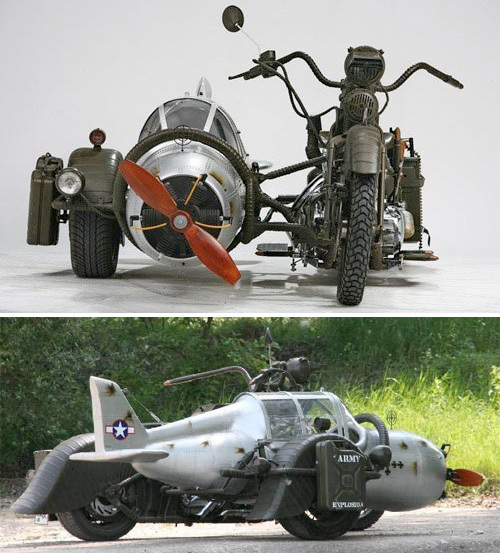 Motorcycle With A WWII Fighter-Inspired Sidecar – Why Ask Why? | OhGizmo! Sometimes you come across a creation so unique it seems a waste of time to ask “Why?”, but there are a few other questions I have about this WWII fighter-inspired motorcycle sidecar. Like why does Motorcycle News refer to this as a German plane when there’s clearly a U.S. Air Force logo on the tail, and why does its creator, Henrik Toth, own and operate a ‘wild wild west’ themepark/village just outside of Budapest when he seems more like a WWII aficionado? And most importantly, if I buy one does it make airplane sound effects on its own or do I have to provide them, because I’m good either way. It looks like a URal. I know someone who wanted one too. Maybe not with a mini plane, but a modern URal.